Babak Salari is a Montreal-based photographer and educator who chronicles lives at the margins of society. His documentary projects include: Iranian artists in exile; matriarchal, indigenous communities in Mexico; and gays and transvestites in Cuba. Recently, he documented those displaced and brutalized by war in Afghanistan, Pakistan, Iraq, Lebanon and Palestine. His interest in photography began as a teenager in his native Iran where he contributed to various publications. At the age of twenty-one, his political activities resulted in his imprisonment for six months by the Khomeini regime. Upon his temporary release from jail, he fled to Pakistan and, a year later, arrived in Canada where he resumed his study and practice of photography. His new documentary work Traumas and Miracles: Portraits of Northwestern Bulgaria is dealing with the sense of disorientation, loss, pain, and isolation. National Art Gallery of Sofia, Bulgaria, Macedonian Museum of Contemporary Art, Thessaloniki, Greece, and Centro Historico in Merida, Mexico, and published in several magazines. His four main publications Faces, Bodies, Personas: Tracing Cuban Stories, Remembering the People of Afghanistan, My Street Cuban Stories, and Traumas and Miracles: Portraits from Northwestern Bulgaria, were published by Janet 45 in Bulgaria in 2008, 2009 and 2010 respectively. 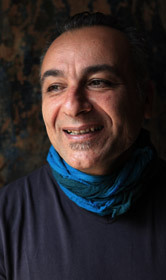 He has received many awards including a Gold Addy from the American Ad Federation in 2004 for his work Locating Afghanistan.